As of July 31st 2018, we’ve helped 55,963 people get tennis elbow pain relief with our best selling tennis elbow brace. More importantly, we've personally consulted with 126 clients and understand exactly what you're going through. We take our role as tennis elbow experts seriously... it's in our name after all. As a former tennis elbow sufferer, let me tell you what I went through but first let me introduce myself. My name is Howie and I suffered from tennis elbow for 5 years while playing tennis and weightlifting before I found the solution. I've been tennis elbow free for 5 years now. I suffered from depression and thought my "tennis elbow blues" would last forever and I had lost hope. And the "solutions" the medical industry had for me were actually just masking my symptoms, not getting to the root cause. You're In A Vicious Cycle! Tennis elbow is thought to affect 2-3% of the U.S. population between the ages of 30 and 60 years. That's several million people struggling with the decision to have surgery, cortisone steroid injections and/or swallow anti-inflammatory pills. Simply put... the medical establishment has led you to believe that there's no other option out there. Thanks to the insurance companies, even your physical therapy sessions are cut down to 1-2 weeks before you have to pay full price. I wish I could treat my tennis elbow from the comfort and privacy of my home without having to pay several hundreds to thousands of dollars? This is your chance to get the relief you need so you can get back to normal again. And you'll have to consider surgery, more injections, more pills... which may not even work! ✅ Address the root cause of your tennis elbow, not just the symptoms! ✅ Get back to normal quickly without taking time off! I've had tennis, and golfers elbow for well over a year now. Had physio, acupuncture, used a strap etc. Tried stretches advised by the physio. It was getting worse if anything. Along with a tight full elbow support, while doing anything strenuous, and doing the new stretches in your videos, both sides of my elbow are better than they've been for over a year. Thanks for making life, and training, a lot better. I just want to say THANK YOU for putting this program together. After years of playing golf my tennis elbow pain started to really limit not only my enjoyment of the game, but my lifestyle. This program got me back on the course pain free. Thanks again and I'll be telling everyone about you guys. ✔️ Full Access to a licensed physical therapist! ✔️ Get Your Questions Answered! Live and Recorded Video calls. ✔️ Lifetime Access to a medical professional! ✔️ No Ongoing Cost for a medically licensed staff member. ✔️ The root cause of most tennis and golfer's elbow are neck and shoulder issues. ✔️ Learn how to perform shoulder releases (e.g. impingement). ✔️ Addressing specific trigger points for your tennis and golfer's elbow. ✔️ Discover the neck movements that will release and relax your nerves that run down your arm through your elbow, hands and fingers. ✔️ Cut Your Recovery Time by 70% and jumpstart your healing process! ✔️ Get Started Right Now! ✔️ We will personalize your journal for your specific trigger. ✔️ Takes 5 Minutes A Day! ✔️ Addresses Root Cause, Not Symptoms! ✔️ Includes a separate Lifetime Group Membership so you don't have to pay more! ✔️ Online access to a licensed physical therapist, your fellow tennis elbow sufferers and myself. ✔️ Most people don't know that tennis elbow sufferers are 75% more likely to get golfer's elbow compared to the rest of the population. ✔️ If you have both tennis and golfer's elbow, we've got you covered! This will be all you'll ever need for tennis and golfer's elbow relief! So What Are You Getting Today? For a limited time, it's only a one time payment of $37! ✔️ Immediate Relief: Our specially fitted compression pad allows the right amount of tension to be taken off on the sore tendon allowing you to do your activity without pain. ✔️ Get The Quickest Relief Possible by using your braces to prevent further injury with your repetitive activity, especially when combined with our Program for permanent relief. ✔️ Amazing Value: You get TWO elbow braces for a much lower price. You can keep one in your gym or bag and have another one at home or work so you always have it available! ✔️ Use On-Demand: To be used only during the activities or movements that cause pain (e.g. work, gym, sports). ✔️ Versatile: One size fits most and can be used on the left or right forearm. Comes with a smaller strap for smaller forearms. Works great for women and men thanks to the adjustable strap. ✔️ Strong & Safe: Strong hook & loop strap and guaranteed to not cut off circulation or have a tourniquet effect on your forearm. ✔️ Fast Shipment: We pay shipping and deliver in 3-4 business days (5-8 days for Alaska, Hawaii & US Territories). The Ultimate Tennis Elbow Solution revolutionized my approach to preventing and treating tennis elbow and has been a real game changer for me. It's really improved the quality of my tennis game as I don't have to worry about my backhands anymore. I was really surprised at how much personal attention I am able to receive from Howie and Dr. Dimon-Hardesty. I had tennis and golfers elbow. I purchased this program and it really helped me get better. The program has the right amount of support I needed, live support from a licensed therapist. Now I'm back to normal and have the freedom from tennis/golfers elbow!! The personalized access to a licensed physical therapist and the Simien Tennis Elbow Brace deep discount deal will be going away once the group has reached its capacity, which could be in the next 24 hours. So click the green button above now to join our Program and claim your special Simien Tennis Elbow Brace deal before it's too late! ...all for a low price with a limited time offer Lifetime Membership! Thanks so much for reading this letter and I look forward to seeing you in the group. P.S. This is all $1.23 per day if it was only for a month, but it's for a lifetime with no hidden fees (so it's really pennies per day!). Accept the offer and just say “YES”. I'll just go on YouTube or Google and figure it out myself, why do I need you? Comprehensive Program: No one else specializes exclusively on tennis elbow or covers what we're offering. You're only getting a tiny piece of the puzzle elsewhere, at best. We Focus on the Root Cause: No other resource goes into the potential "upstream" causes of your tennis elbow (e.g. neck, shoulders, posture) with the Upstream Release Method and also includes our 7 Step Program. Experience: No one else can say they've had 55,963 customers as of July 31, 2018. We live and breath tennis elbow. It's even in our name! Medical Professional Staff: We always have a medically trained staff member ready to answer your questions in a private online setting through email, video calls or membership group page. Will you charge me consulting or ongoing fees after my purchase? Absolutely not, we're offering this as a one time payment with NO ongoing consulting fees and there's NO hidden hourly/monthly/annual fees for you. What if I have golfer's elbow? Some of this sounds like it's too good to be true. 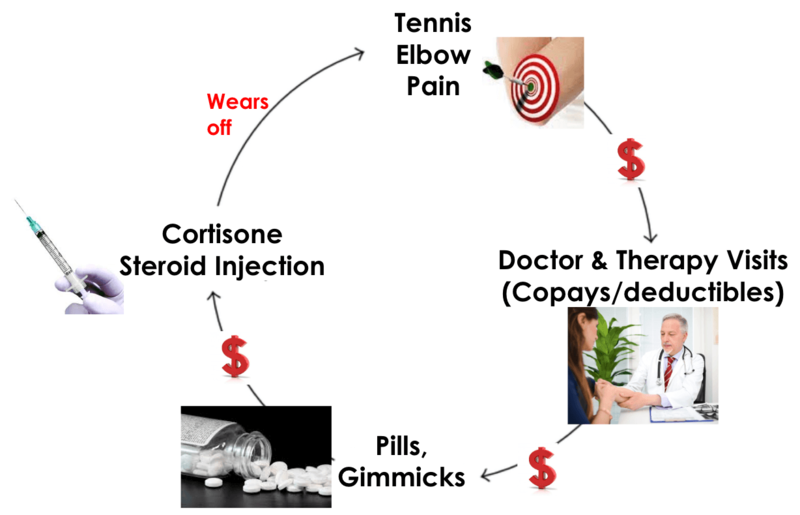 A lot of tennis elbow sufferers go out and buy all kinds of products to mask their pain and expect a miracle result. It is "too good to be true" if you believe that braces and other devices will be the ultimate answer for relieving tennis elbow pain. The hard truth is that they only provide a temporary relief (which is not bad when you're hurting or have to go back to work the next day). That is why we're offering both the braces for short term pain relief combined with long term relief from the Ultimate Tennis Elbow Solution Program. The braces have a protective and preventative effect on your sore muscles and tendons, while the program addresses the root cause of tennis elbow for good. With our 120 Day Guarantee, you have nothing to lose and everything to gain. Including your peace of mind, playing your favorite sport without pain, getting back to work to support your family and getting out of the funk you're in. No one really understands how much of a downer tennis elbow is and what you're going through. It's kind of an "invisible thief" that slowly robs you of enjoyment in your life. Get started on your healing journey! All orders are processed through a secure network. Your information is never shared with a third party. We respect your privacy..